The Sample Pro Pump is easy to disassemble, without any tools, and simple to clean to eliminate any potential cross contamination. That includes the exclusive Sample Pro disposable bladder, which snaps in and out without any clamps, so they can be discarded after each well is sampled. 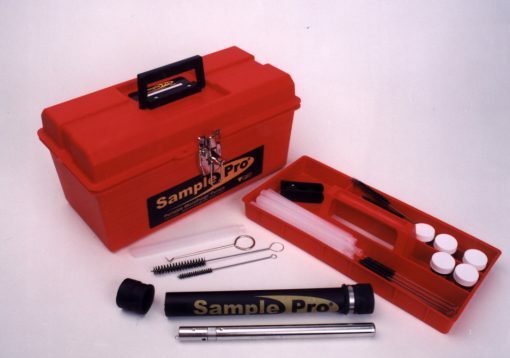 The Sample Pro pump is available in two diameters: 1.75″ (4.45cm) to fit in 2″ (50mm) monitoring wells or larger; and 3/4″ (1.91 cm) to fit small diameter wells and direct-push boreholes. Both pump models are capable of pumping from depths up to 200 feet (61m). Exclusive Sample Pro disposable bladder is quick & easy to replace in the field, for fast cleaning. Rugged, reliable, complete system designed for easy use in the field. Quick 1/4 turn disassembly with no tools means simple, fast and complete field cleaning. Disposable bladders and push-in tubing replace in seconds, speeding you on to the next well. Solid stainless steel construction is truly durable, with no motors, bearings, or impellers to go bad. Even if the pump fills with silt, it can be put into action again with a quick, simple cleaning. Output pressure is strong and controllable. Direct push technology and low flow sampling reduce the costs of well installation, sampling and purge water handling. This is the only sampling pump that minimizes turbidity and silting caused by the well surging of other devices such as bailers and jerk samplers, and collects quality samples from small diameter wells at significant savings. Pump Model Sample Pro 3/4 in. • Fluid Discharge 1/4 in. (6.4 mm) O.D.